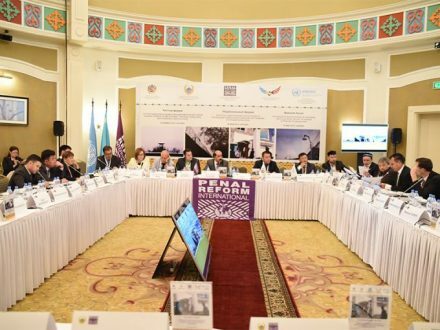 On 30 May 2017, PRI’s Central Asia office (PRI CA) hosted the National Forum on preventing the radicalisation of prisoners and countering violent extremism in prisons in Kazakhstan in Astana, Kazakhstan. The aim of the dialogue was to create a constructive platform to discuss methods of countering radicalisation in prisoners and preventing violent extremism. As a basis for discussions, the Forum presented the results of a study conducted by PRI on the situation within institutions and the consequences of the spread of radical views, both within institutions and beyond. The dialogue brought together international experts from Great Britain and Jordan, employees of correctional facilities, as well as representatives of civil society, state bodies, the scientific community and international organisations. ‘Recently, the issue of the spread of radical Islam in the institutions of the penitentiary system has become very relevant, since it is in places of deprivation of liberty where those convicted of religious extremism and terrorism are concentrated,’ said Azamat Shambilov, Regional Director of PRI CA. ‘It should be noted that places of deprivation of liberty are a favourable recruiting environment for adherents of violent extremism…employees of correctional institutions and criminal executive bodies need to have sufficient professional knowledge and skills in this field of activity’. Over 400 prisoners in Kazakhstan have been convicted of extremist and terrorist offences. Between 2012 and 2016, there was a five-fold increase in the number of people going abroad to participate in military operations. According to the government, the southern and western regions of the country are most vulnerable to radicalisation, with young people aged between 14 and 29 being the primary recruitment target group for foreign terrorist militants. The total number of convictions related to extremist and terrorist offences rose from 154 in 2014, to 317 in 2015, and 554 in 2016, of which 130, 193 and 327 related to extremism, and 24, 124 and 227 related to terrorism (respectively). ‘The Ministry of Internal Affairs of the Republic of Kazakhstan and its Criminal Executive System’s Department are recommended – in cooperation with international and national non-governmental organisations, the Spiritual Directorate of the Muslims of Kazakhstan, and special state and law enforcement bodies – to develop appropriate by-laws, rules, and regulations regarding the management of militant extremist convicts and introduce them into the practice of the Criminal Executive System,’ said M.Ch. Kogamov, Professor of Law and an expert in the field. 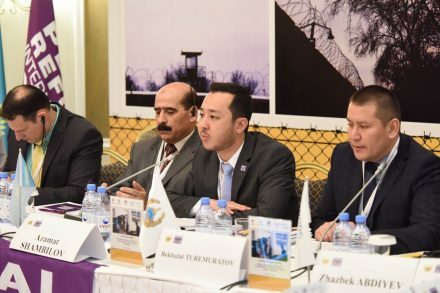 The Forum ended with the development of a number of practical recommendations to prevent the spread of influence of violent extremism and re-radicalisation, and was followed up by two-day meetings and working groups to strengthen the capacity of prison officials in countering this phenomenon. For further information, please contact Azamat Shambilov, Regional Director of PRI CA, at: ashambilov@penalreform.org. Read PRI CA’s full press release on the National Forum in English, Kazakh and Russian. PRI, in cooperation with government bodies, aims to strengthen the capacity of prison staff to prevent violent extremism and to ensure proper management of prisons in crisis situations. See PRI’s report, Preventing radicalisation in prisons – developing a coordinated and effective approach, and read about the expert roundtable organised by PRI in June 2016. Findings from an experts' roundtable hosted by PRI in December 2015.